Heel Pain? Could be Your Heel Bone! 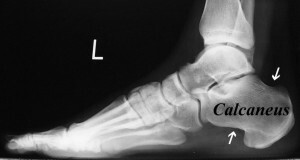 After watching the USA and Japan duke it out in over time at the FIFA 2011 Women’s World Cup, one may think to themselves, “Do their feet hurt after all that running around?” The calcaneus, or the heel bone, is the largest bone in the foot and the first part of the foot to hit the ground. This makes the heel bone more vulnerable to injury and something seen often at the First Coast Foot and Ankle Clinic. Heel pain is an issue many people on the First Cost deal with and it is commonly attributed to plantar fasciitis. Dr. Vimal Reddy believes it is best to X-ray the heel in order to check for a stress fracture, which can occur in any bone of the foot as a result of overuse. As we age and our bones become weaker, we are more at risk for stress fractures, and the calcaneus is one of the most common places for it to happen. Utilizing a digital X-ray to quickly and efficiently examine and diagnose, Dr. Reddy can even tell you about osteoporosis, since he is able to use X-rays of the calcaneus as a measure of how strong the bones are. Of course, people will have accidents and have been known to break the calcaneus, like any other bone in the body. This happens most when individuals fall from great heights and land on their feet. Sadly, they usually break both, and fractured heel bones are a very serious injury due to the difficulty of healing. The individual may never function the same way again. As a podiatric surgeon, Dr. Reddy is qualified to surgically correct these injuries to line up the bony fragments and work towards the best possible recovery.